Isagenix International has been named one of the 2018 Arizona's Most Admired Companies. Isagenix International, a global health and wellness company providing nutrition and lifestyle solutions, has been selected as one of the 2018 Arizona’s Most Admired Companies by Az Business Magazine and BestCompaniesAZ. There were 187 entries for the award this year, the most in its history. Isagenix was one of 55 honorees. Arizona’s Most Admired Companies were chosen based on performance in five areas: workplace culture, leadership excellence, corporate and social responsibility, customer opinion, and innovation. Isagenix Chief Executive Officer Travis Ogden said the company is honored to receive the award. Workplace culture: The company provides exceptional healthcare benefits as well as a friendly, engaging atmosphere with fun activities such as an employee appreciation event with food trucks, games, and music for employees and their families. A unique offering is the Employee IsaBody Challenge®, a 16-week health transformation program. In 2018, 353 headquarters employees participated in the Challenge, losing a combined total of 1,498 pounds. Leadership excellence: The high-caliber leadership team behind the company’s growth and worldwide expansion has led the company to achieve $6 billion in cumulative global sales since its inception in 2002. That team includes Co-Founders Jim and Kathy Coover, Founder John W. Anderson, Chief Executive Officer Travis Ogden, and Senior Vice President of Global Field Development and Culture Erik Coover. Corporate and social responsibility: Isagenix has embodied its core value of contribution in many ways in Arizona, from partnering with local organizations to providing product and monetary donations. Most recently, the company launched the Isagenix Legacy Foundation, which raised $2.3 million in 24 hours to support its mission to provide healthy nutrition for underserved children, wellness education for all, and aid for those affected by natural disasters. Customer opinion: Isagenix enjoys a strong reputation among customers, as demonstrated by its A+ Better Business Bureau rating. To help ensure exceptional customer service, in 2017 the company launched the Customer First initiative. Customer First makes it easier and more affordable for new customers to join Isagenix and helps customers who wish to become independent distributors better understand how to engage in the business successfully and compliantly. Innovation: The company’s unique, innovative approach to weight loss features a cleansing and fat-burning system that combines “Shake Days” and “Cleanse Days” using effective, nutritious Isagenix products. The company also supports weight loss through the IsaBody Challenge, a 16-week life-changing transformational journey for Isagenix customers. The contest seeks the most inspirational and motivational stories about how participants have made healthy body and life transformations. To learn more about Isagenix, visit our newsroom at Isagenix.com, like us on Facebook at Facebook.com/Isagenix, and follow us on Twitter and Instagram at @Isagenix. Established in 2002, Isagenix provides systems for weight loss, energy, performance, healthy aging, and wealth creation. With nearly 600,000 customers worldwide and more than 100 life-changing products, packs, and systems globally, the company is committed to producing Solutions to Transform Lives™. Since its inception in 2002, Isagenix has generated $6 billion in cumulative global sales through a network of independent distributors in the U.S., Canada, Puerto Rico, Hong Kong, Australia, New Zealand, Taiwan, Mexico, Singapore, Malaysia, Colombia, Indonesia, the United Kingdom, Ireland, the Netherlands, Belgium, and Spain. 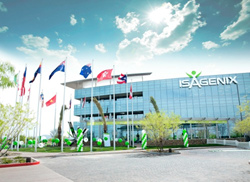 Isagenix is a privately owned company with headquarters in Gilbert, Arizona. For more information, visit Isagenix.com. Over the past 30 years, AZ Big Media has grown to encompass not just Az Business magazine, but a host of other publications and signature events. Az Business magazine is the state’s leading business publication. Published by AZ Big Media, the magazine covers a wide-range of topics focusing on the Arizona business scene, and is aimed at high-level corporate executives and business owners. BestCompaniesAZ specializes in helping corporate clients develop, strengthen and market their unique employer brands through a variety of events, awards and communications programs. Specialized services include employee opinion surveys, benchmarking, employment branding, recruitment strategies, award consultation and promotional services. BestCompaniesAZ is proud to be chosen as the Consulting Partner for the Top Companies program, serving five consecutive years, and Founding Partner for Arizona Most Admired Companies.